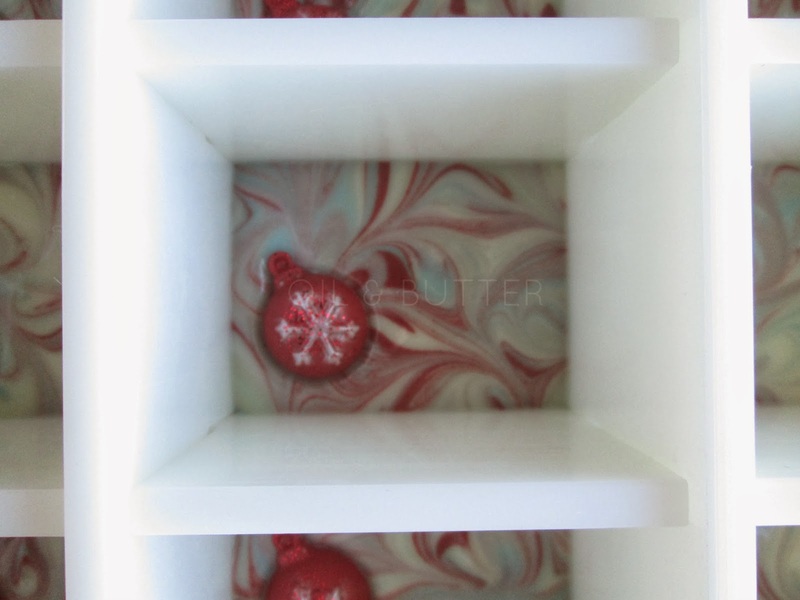 I’ve been plotting my Christmas soaps for a while now, and this was the first Christmas-themed batch that I decided to make this year. I used a new fragrance oil, called Dance of the Sugar Plum Fairy, from Nature’s Garden. The description: "A charming fragrance oil which is filled with surprises to delight all of the senses with plums, dark cherries and sweet oranges enhanced with peppery woody undertones." Plums? Cherries? Peppery? Woody? Ummm, yes please! It is definitely a complex fragrance; Christmassy (it's a word!) and yet juicy at the same time, I just love it! I think this is a new fragrance for NG because there weren't any reviews when I bought it, but it behaved beautifully in CP. Because the descriptions says it will discolour to a yellow-orange, I did add titanium dioxide to my base oils; however, I don’t know if that was necessary or not, I see no hint of discoloration yet but will try to update this again in a few weeks. The scent comes through strong and true in CP soap. I think this is my favorite of the 3 new Christmas fragrances that I tried this year. 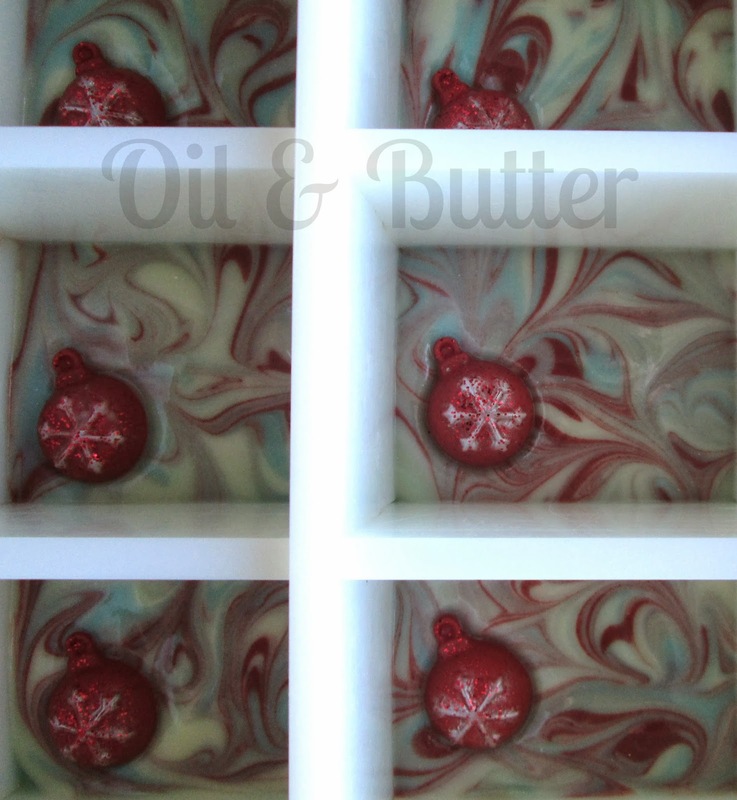 So far, I have 2 more Christmas soaps planned, but I may make more as the inspiration strikes. Have you started your Christmas soaps yet, and are there any favorite Christmas soaps that you make every year? The ornaments are super cute :o) The new FO sounds so good. I used a year ago a FO that was called Sugar Plum Pixie and the scent was really good, but I have not seen another FO discolor as fast. The soap batter got brown as I poured the FO. Oh wow, the Sugar Plum Pixie must have had a lot of vanilla in it to discolor that quickly and drastically! Cee, I think I am in love with your Christmas soap! It's gorgeous! The red ornament makes it so cute and extra special! Is the ornament cp soap too and does it easily release from the chocolate mold? Aw, thanks Silvia! The little ornaments are MP soap, but I think CP soap would work just fine (I would add sodium lactate just so they are nice and firm for removal). The chocolate mold is actually silicone, so the soap released easily! How cute they are! The ornaments really give the festive look to the soap, ant they look so real. I see you have some left, you can hang them on the Christmas tree! I think I may use those leftover ornaments on some soap cupcakes, but I may make some extras to use on the tree, such a cute idea! beautiful Cee, as always. 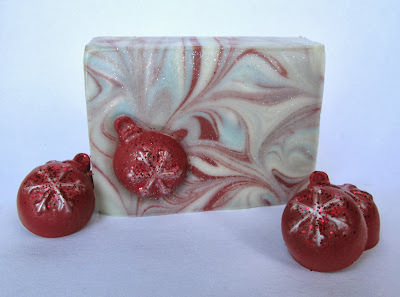 wanna see more of your christmas soaps..
the ornaments are so cute...love that shade of red! The soaps are gorgeous as always. Lovely swirls and the fragrance sounds real nice...the dark cherries and sweet oranges in the description sound wonderful..mm! They are so beautiful, once again! I always admire your crafty work you are able to do on the top of your soaps. Thanks Signe, that's so sweet! Thanks Gordana, I really missed you guys too! I'm so glad to hear you've been enjoying a nice October. We've had an unseasonably warm (and dry!) October too, I'm loving it! I'm so glad my soaps have inspired you to start thinking about the upcoming season, it's hard to believe it's just around the corner already! 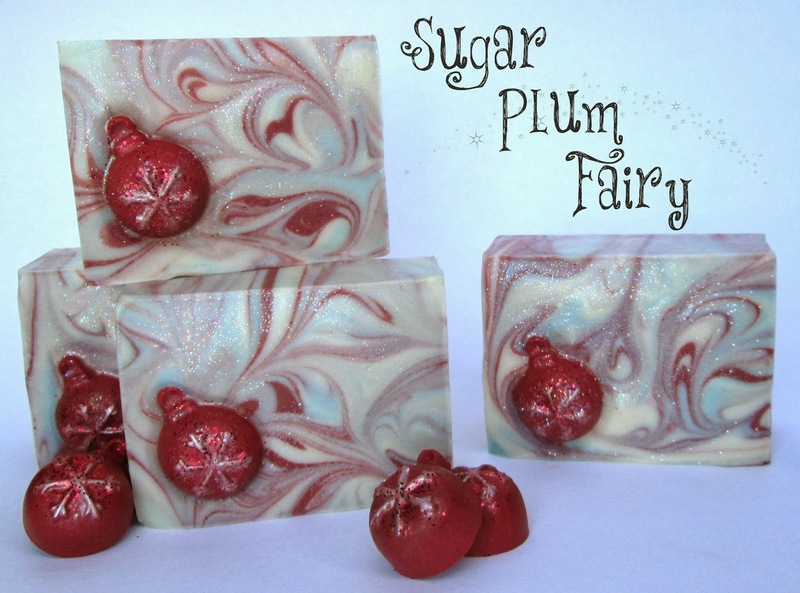 Your Sugar Plum Fairy soap is gorgeous, Cee! The swirls are beautiful and the little ornaments are so cute! The mica dusting and glitter really make the details pop. I've made four batches of holiday soaps since September, and I think that will be enough for gift-giving. I usually have to make something pepperminty, and BB's Fresh Snow is always a favorite, too! Lovely Cee! Just about when I think I saw it all, you come up with a new post and surprise me all over again! Don't let us wait long for the next one! Love the soap and the video Cee! You always teach me something new....Thank You! So glad your back! Wow, Christine, the little ornaments are so cute! You are really talented and we really missed these video's ! Your final soap looks gorgeous, good enough to put on the christmas tree ,I would never dare to use it! If you are looking for a solid contextual ad company, I recommend that you have a look at PropellerAds.